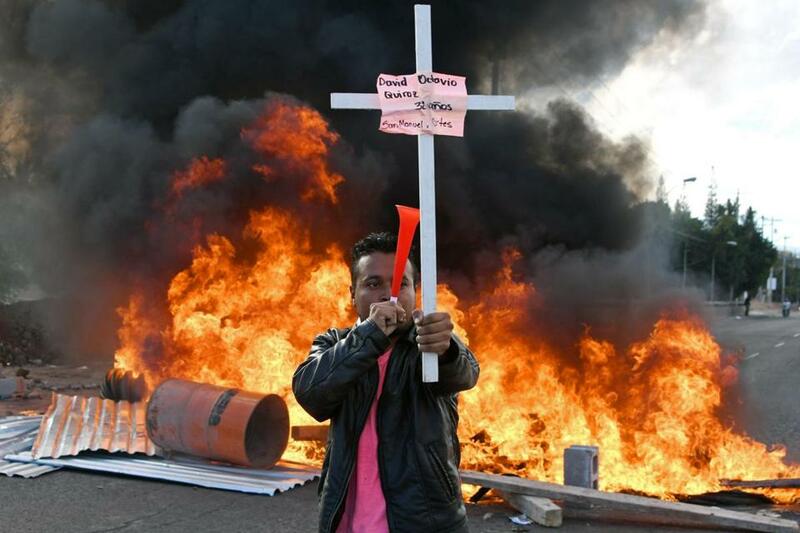 A supporter of the Honduran Opposition Alliance Against the Dictatorship held a cross among barricades protesting the reelection of President Juan Orlando Hernández. Ritual denunciations of Venezuela, however, do not reflect true concern about the fading of freedom there. Venezuela has been a thorn in our side — to some, a dagger at our heart — ever since the late Hugo Chavez was inaugurated as president in 1999. During the Iraq War, Chavez famously called President George W. Bush “the devil.” Since his death in 2013, Venezuelan leaders have continued to support countries and movements we consider anti-American. Venezuela defies and challenges our power in the Western Hemisphere. That has led us to discover a passion for the democratic rights of its citizens. Yet last weekend, with the blessing of the United States, a government that evidently stole an election was installed in Honduras. President Juan Orlando Hernández was sworn in for a second term despite the fact that the Honduran constitution forbids re-election. 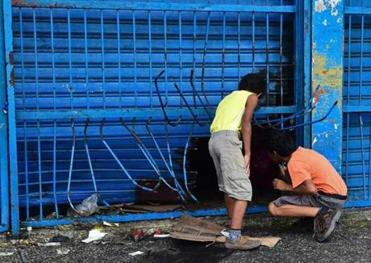 What we say we detest in Venezuela, we pretend not to notice in Honduras. Last November’s presidential election in Honduras was straight from the banana-republic playbook. Nonetheless, vote counters announced that the opposition candidate was winning and seemed headed to victory. Then the counting stopped. After several days of silence, the official result was announced: Hernández had been re-elected by a margin of 1.5 percent. Protesters poured onto the streets. More than thirty were killed. Luis Almagro, the Organization of American States secretary-general, demanded a new election. He had been harshly attacking Venezuelan leaders for their subversion of democracy, and felt compelled to apply the same standard to Honduras. Washington felt no such compulsion. The State Department pronounced itself “pleased” with the Honduran election. A leaked diplomatic cable explained why: President Hernández has “consistently supported US interests.” He showed that support most recently in December, when Honduras was one of only nine countries at the United Nations that voted to approve the opening of an American embassy in Jerusalem. A relief effort is underway, including in Massachusetts, to send supplies to children in Venezuela. Staging rigged elections and repressing dissent is not enough to qualify a country as a banana republic. An economy built on exporting fruit and other foodstuffs helps. The essential fact defining a banana republic, however, is the power of the United States to shape its fate. Few countries qualify as fully as Honduras. The United States overthrew a nationalist Honduran government in 1911. That opened the country for United Fruit and Standard Fruit. It also led to decades of strikes by banana workers, some of which were violently repressed. During the 1980s, the United States militarized Honduras. It became a base for semi-covert war against the Sandinista government in neighboring Nicaragua. Conflict and repression led tens of thousands of Hondurans to flee their homeland. Many young Honduran men ended up in Los Angeles, where they fell into the brutal world of street gangs. After Central American wars ended, they were deported, and took gang culture home with them. This is how Honduras came to have one of the world’s highest murder rates. Besides restoring the power of the Honduran elite, the post-coup regime has granted lucrative permits to foreign mining corporations. Their projects have set off waves of protest. More than 100 activists have died violently since the coup. “Nowhere are you more likely to be killed for standing up to companies that grab land and trash the environment than in Honduras,” the London-based advocacy group Global Witness recently concluded. We support this form of democracy because Honduras has rid itself of a leftist regime and replaced it with one friendly to Washington. With the same breath, we denounce repression in Venezuela. We demonize one anti-democratic regime in our hemisphere while embracing another. Supporting countries that do our bidding, and punishing those that defy us, may make sense. Pretending that we impartially defend democracy does not.